This is not a random list of prominent Chicago lawyers. 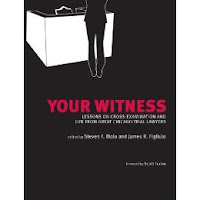 These are some of the chapter authors in a new book, Your Witness: Lessons on Cross-Examination and Life from Great Chicago Trial Lawyers. Lawyers Steven F. Molo and James R. Figliulo collected and edited these essays, along with Chicago Tribune reporter Maurice Possley, credited by Molo and Figliulo as the project's managing editor "who took what were sometimes well intended but hurried writings of busy trial lawyers and transformed them into the smooth prose that grace these pages." Chicago lawyer Scott Turow provides a foreward. This is the kind of book that you can open to any random page and start enjoying. That's what I did after the publicist for the Law Bulletin Publishing Company was kind enough to send me a copy. At first I thought the book skewed too heavily toward criminal cases -- especially criminal cases in Federal Court -- but that was a consequence of where I jumped in... and also of the fact that more criminal cases come to trial than civil ones. Most of the stories about civil cases have to do with the skewering of expert witnesses. I never did tote up figures to determine how many stories dealt with criminal cases and how many with civil cases. Many of the stories included in Your Witness are what might be called "war stories," the kinds of stories that lawyers of all stripes tell over lunch or at cocktail parties. But the authors here are big-time, successful lawyers and this makes their stories that much more entertaining and useful. Two of the chapter authors, Michael Coffield and Don Hubert, passed away during the preparation of the book; a third, Judge Pincham, died after the book went to press. Messrs. Molo and Figliulo estimate that the lawyer-authors of these chapters aggregate roughly 1,600 years of trial experience. These are stories that will teach the reader many things -- even readers who aren't trial lawyers. Most of the authors write about themselves -- their own successes (and failures). This is as it should be: You will not often find many shrinking violets in any group of trial lawyers. Many, as was famously said of Theodore Roosevelt, want to be the bride at every wedding and the corpse at every funeral. But several of the authors include appreciations of other trial lawyers they have seen in action. Pay particular attention here. In a setting like this, the authors have no motive to bestow false praise. Your Witness will be of interest to people outside Chicago, too. Even though all of these lawyers are... or were... based in Chicago, several of the tales are set in other jurisdictions, such as Judge Leighton's story of a federal habeus corpus proceeding in Oxford, Mississippi in the late 1950s. You may find Judge Leighton's account of his conversation with the U.S. Marshal on that occasion particularly powerful; I thought it conveyed the essence of that time and place in a third of a page. While each of the authors is focusing on the technique of cross-examination, the book is not repetitive. Sure, the standard rules are set out many times -- but then the authors tell you why it didn't make sense to follow this rule or that one in a particular case. In Your Witness you'll learn, for example, never to ask a question on cross to which you don't know the answer... unless the answer doesn't matter... or unless the possible reward of securing Answer A outweighs the risk of obtaining Answer B. Many of the writers stress that cross-examination is an opportunity for the lawyer to tell the client's story through a witness -- but to do this the lawyer must be the focus of the jury's attention, not the witness. A variety of entertaining suggestions are offered as to how this may be done. One overriding lesson is presented: This is art, not science. Another note at the beginning of Your Witness advises that the "authors' royalties, less expenses, are being donated to The Chicago Bar Foundation, the charitable arm of the Chicago Bar Association." That's not the only reason to buy Your Witness, but if that helps you make that decision, that's all well and good, isn't it? Debra Cassens Weiss reported yesterday on the ABA Journal website, Law News Now, that there are a million lawyers in the U.S. -- but -- who'd have believed it? -- there are twice as many artists. Law News Now links to article in the Washington Post about a new study released by the National Endowment for the Arts which reports that nearly two million people identify themselves as "artists." The NEA says that "artists are one of the largest classes of workers in the nation, only slightly smaller than the U.S. military’s active-duty and reserve personnel (2.2 million). Artists now represent 1.4 percent of the U.S. labor force." In Illinois, jurors may be permitted to take notes at trial as authorized by 705 ILCS 315/1(b). Jurors in Australia can take notes, too. Counsel trying a drug conspiracy case in the courtroom of Sydney District Court Judge Peter Zahra thought the jurors hearing the case were quite "diligent" because they seemed to be taking "copious amounts of notes." Then someone noticed that some of the jurors weren't just writing horizontally... they were writing vertically, too. It turns out, according to the linked BBC News article, that five of the jurors were working Sudoku puzzles while the evidence was being presented. One juror told the Australian Associated Press that the puzzles "helped keep her 'mind busy' as she listened to" the testimony. "Some of the evidence is rather drawn out, and I find it difficult to maintain my attention the whole time," she said. Judge Zahra has dismissed the jury in the three month drug conspiracy trial, a trial that, the BBC noted, had cost Australian taxpayers over a million Australian dollars ($945,000 U.S.). The trial will begin again in a couple of weeks. Chicago solo practitioner James N. O'Hara ran unopposed for the Henry vacancy in the Judicial Subcircuit in the February primary. He would have taken office in December. The Supreme Court, however, has appointed O'Hara to the seat to which he will soon be elected. The appointment is effective June 16. Can a lawyer drop off a computer for ecycling? I've written twice now about the City of Chicago recycling facility which takes, among other things, consumer electronics for ecycling. City residents can take their old computers there and expect that the machines will be disposed of responsibly. The City may even make a buck or two from reducing the computer to its component parts and selling the more valuable parts. But can a Chicago lawyer take his or her obsolete computer there for ecycling? Machines from one's office are not supposed to be dropped off there, and there are services which will -- for a fee -- pick up used computers at an office and supply documentation, for each machine, that the hard drives have been responsibly destroyed. Tossing [your old computers] in a Dumpster® seems wasteful; also, much of this equipment is considered hazardous to the environment and must be managed and disposed of in compliance with federal, state, and local laws and regulations. You might try to sell old computers for a few cents on eBay or donate them to charity. Any of these disposal choices could cost you your law license. Why? Because old computers are packed with confidential client information that you have an ethical duty to protect. Further, the computers undoubtedly contain sensitive firm information and software licensed to your firm or organization (for which you have specific obligations under end-user license agreements). Giving away control of and access to old computers - through the Dumpster approach, an eBay sale, or a charitable donation - can lead to malpractice claims and ethical violations at worst and serious embarrassment at best. There could even be claims for violating HIPAA (for disclosing employee or client healthcare information) and Sarbanes-Oxley (for giving away corporate documents that you must maintain). An article posted on the ABA Legal Technology Resource Center also cites "Federal Trade Commission's Disposal Rule (16 CFR Part 682) on June 1, 2005, [which] says that companies disposing of computer equipment need to take steps necessary to remove personal or financial information from the machines." Both of these articles offer advice for lawyers on "file shredding" programs that will do more than just delete programs. But Kodner and Kennaday warn that, "given enough time and money, someone probably could find a way to recover at least some of your data, no matter what you do." Paranoid? Read some of the hard drive disposal suggestions made by ABA members on Solosez, an electronic mail discussion list that the ABA offers for solo and small firm practitioners. Both articles encourage ecycling -- but recommend that file shredding software be employed before dropping the old machine off. But, says the ABA article, "The surest way to prevent information on the hard drive from falling into the wrong hands is to remove it entirely from the computer. This way the outside shell of the computer can be thrown out but the sensitive information can be retained." Old hard drives should be labeled and stored. 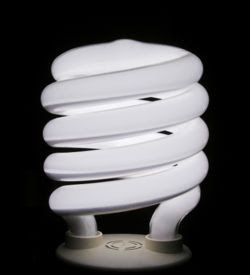 bulb as the symbol for a good idea, right? Last month I mentioned that I'd found, on line, a location in the City of Chicago where, it seemed, residents could drop off ecycling -- old computer components, VCRs, and other electronics. The ecycling facility was supposed to be at 1150 N. North Branch Street (two blocks east of the Kennedy Expressway at Division Street). Today, however, was the first Saturday of the month and I had the opportunity to check the place out. I can now vouch for the place. It's there. Marcus Tullius Cicero, one of the most famous lawyers in history, was proscribed and murdered in the turmoil of the dying years of the Roman Republic. He did not submit to servitude, and he was denied peace. But it can't hurt to ask: I would like a double helping of peace, please; hold the servitude. This globe is one of literally hundreds to be posted today by bloggers around the world as part of a "Blogblast for Peace." You can read all about it here. One hundred seventeen Best Buy stores in eight states are to begin "a free program that will offer consumers a convenient way to ensure millions of obsolescent TVs, old computers and other unwanted gadgets don't poison the nation's dumps," according to AP Business Writer Michael Liedtke's story posted this morning on Yahoo! News. Unfortunately, none of the Best Buy stores involved in the pilot program are in the Chicago area. Lietdke writes, "Depending on how the test goes, the nation's largest electronics retailer may expand the recycling program to all of its 922 stores in the United States." Even with only a small percentage of the chain's stores participating in the pilot program, Liedtke says this test "is believed to be the most extensive free electronics recycling program to be offered by a major retailer so far." Under the pilot program, consumers would be able to bring in "computer processors, computer monitors and televisions with screens up to 32 inches" but not "console televisions, air conditioners, microwave ovens and other large appliances." According to Lietdke's article, all Best Buy stores, even in the Chicago area, already accept "some electronics waste — such as cell phones, empty ink-jet cartridges and worn-out batteries."